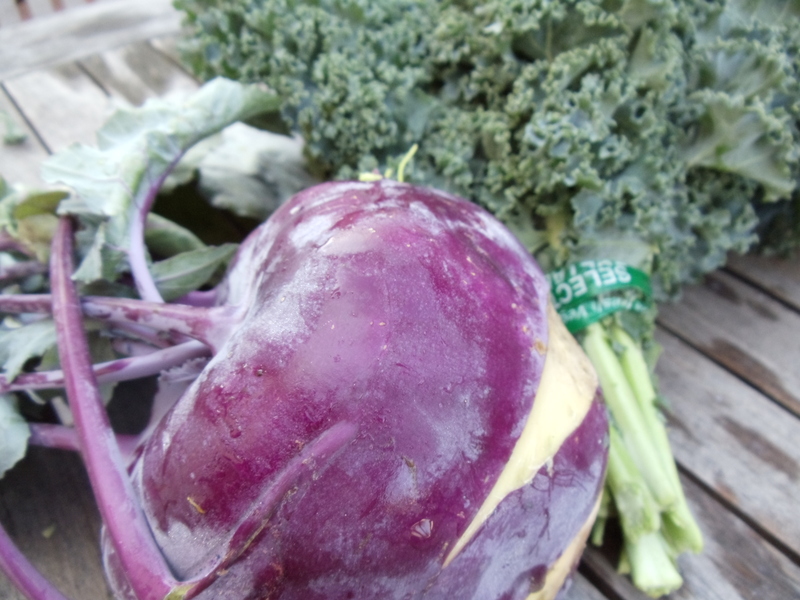 A Tanaka Farms fan had posted an idea to use kale and the ever-puzzling kohlrabi together in a combo of raw and cooked, crisp and savory. The Epicurious.com recipe was pumped up with lots of zingy lime and luscious pistachios, and I tweeked it a bit with a bit of orange and shredded golden beets from the weekly farm box, and ended up with a crunchy and satisfying lunch. This dish could accompany a grilled protein, or become a meatless main course by folding in a bit of steamed quinoa. Use a mandoline to julienne slice the kohlrabi and golden beets. Whisk together lime and orange zest and juice, 2 tablespoons oil, and 1/2 teaspoon each of salt and pepper in a large bowl. 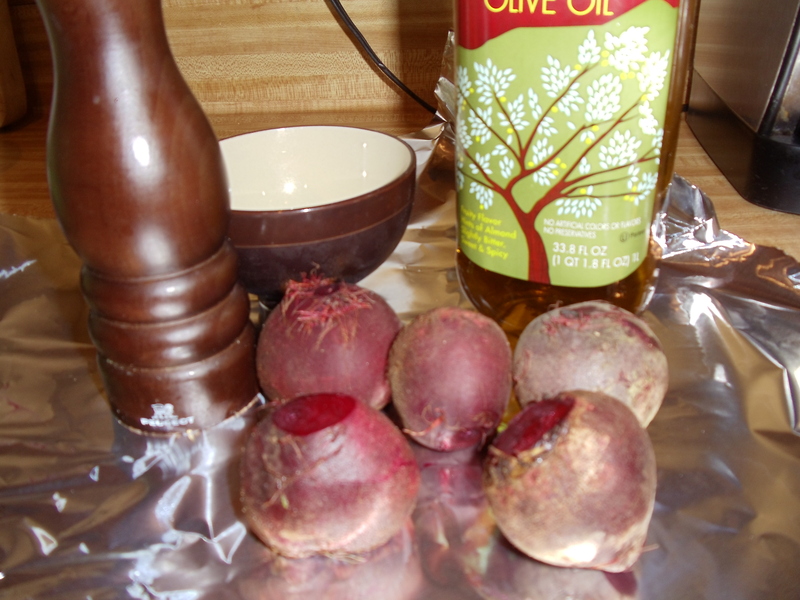 Toss kohlrabi and beets with dressing. Finely chop kale. Heat remaining 2 tablespoons oil in a 12-inch heavy skillet over medium-high heat until it shimmers. Add kale by the handful, turning and stirring with tongs and adding more kale as volume in skillet reduces. Add sliced garlic and turn with the kale. Season with salt and pepper, and continue to cook until kale turns vivid green, about 5 minutes. 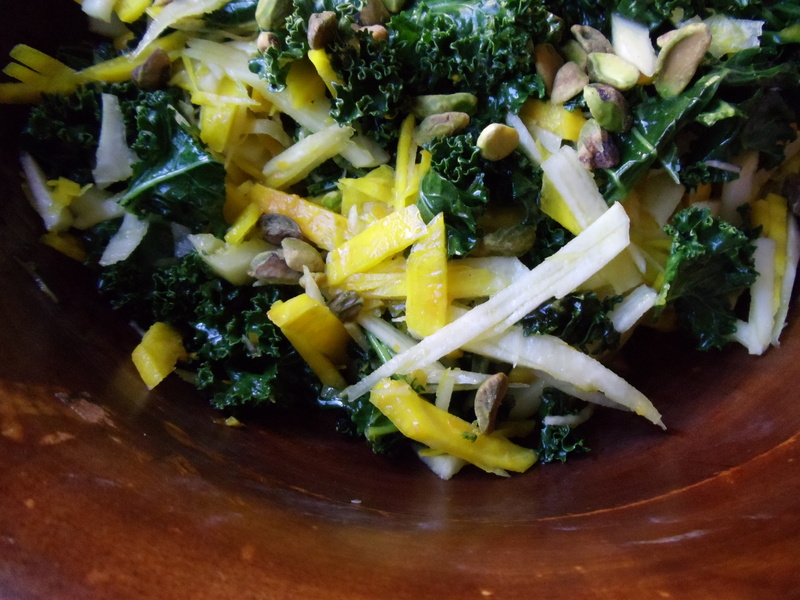 Toss warm kale with kohlrabi and pistachios and serve, or hold for no longer than a few hours. Roasting brings out such lovely components in root vegetables, and with beets, it’s also one of the simplest (and least messy) ways to prepare them. Just cut the greens off, and be sure to save the leaves for a salad or sauteed side dish. Place the beets, skin on, on a sheet of foil. Drizzle them with olive oil, salt and pepper, then throw in a fresh sprig of thyme or rosemary. Seal the foil into a package, and roast in a 400-degree oven. The amount of time in the oven depends on the size of the beet, you can start to check them with the tip of a paring knife for tenderness around 20 minutes. 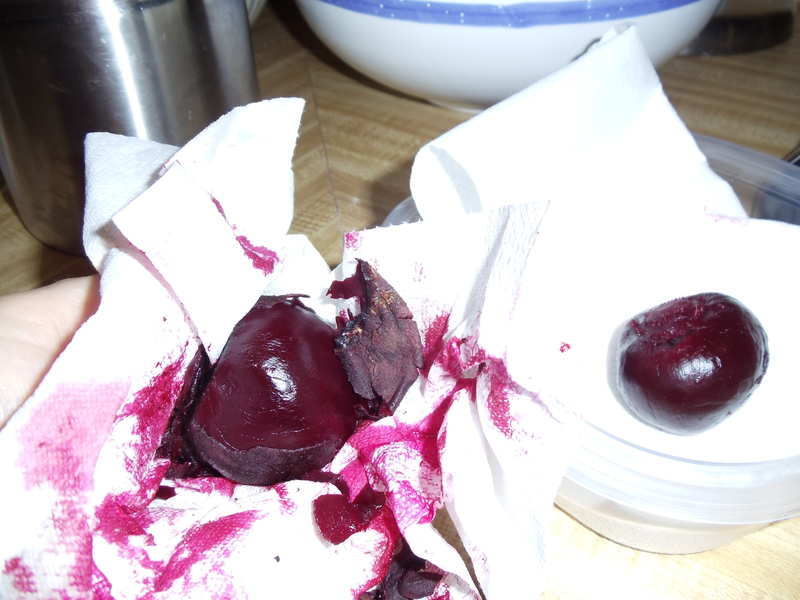 Once the beets are easily pierced with the paring knife, it’s time to rub off the skins, once they’ve cooled a bit. Use a paper towel to hold the beet in the palm of your hand, then cradle paper towel around the beet with your opposite hand, gently pulling pulling the skin down from top to bottom. That’s the best less-mess tip about peeling your beets with a paper towel after they have roasted: the skin easily slides off, and your hands don’t turn pink. I also slice them with a paring knife while holding them in the same paper towel, then I store them in an airtight container until I’m ready to use them in a salad. For a quick, easy salad that helps you follow the philosophy of eating from root to greens, wash your saved beet leaves, stack them up on top of one another, and roll them into a large cigar. Cut them into a fine slice, or chiffonade, then toss them with lemon juice, olive oil, salt and pepper. Top them off with the roasted beet slices and some crumbled goat cheese. Such a lovely combination of flavors; sweet, earthy, bitter, creamy and tart.